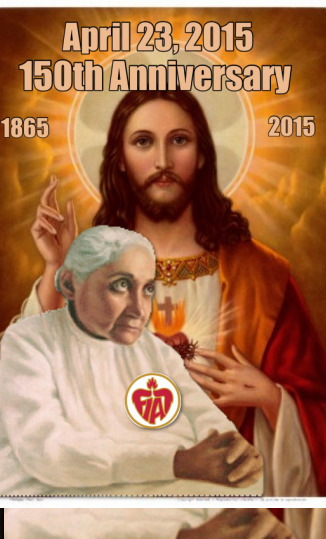 We here at St.Joseph's , for the past 12 years have been praying for the beatification and subsequent cannonization of this extraordinary Servant of God, who with her constant prayers and suffering has yearned for the coming of the Kingdom of the Divine Will to come to reign on earth as it ireigns in heaven. It is a desire of Fr. Al that she be known to all our parishioners and visitors. For more information on this great holy mystic continue reading this blog. mística continúe leyendo más abajo en la parte en Español. Luisa had the good fortune to be born into one of those patriarchal families that still survive in our realm of Puglia (Italy) and like to live deep in the country, peopling our farmhouses. Her parents, Vito Nicola and Rosa Tarantino, had five children: Maria, Rachele, Filomena, Luisa and Angela. Maria, Rachele and Filomena married. Angela, commonly called Angelina, remained single and looked after her sister until she died. Jesus’ voice led Luisa to detachment from herself and from everyone. At about eighteen, from the balcony of her house in Via Nazario Sauro, she had a vision of Jesus suffering under the weight of the Cross, who raised his eyes to her saying: “O soul, help me!”. From that moment an insatiable longing to suffer for Jesus and for the salvation of souls was enkindled in Luisa. So began those physical sufferings which, in addition to her spiritual and moral sufferings, reached the point of heroism. Hardly had the news of Luisa’s death spread, like a river in full spate, all the people streamed into her house and police intervention was necessary to control the crowds that flocked there day and night to visit Luisa, a woman very dear to them. A voice rang out: “Luisa the Saint has died”. To contain all the people who were going to see her, with the permission of the civil authorities and health officials, her body was exposed for four days with no sign of corruption. Luisa did not seem dead, she was sitting up in bed, dressed in white; it was as though she were asleep, because as has already been said, her body did not suffer rigor mortis. Indeed, without any effort her head could be moved in all directions, her arms raised, her hands and all her fingers bent. It was even possible to lift her eyelids and see her shining eyes that had not grown dim. Everyone believed that she was still alive, immersed in a deep sleep. A council of doctors, summoned for this purpose, declared, after attentively examining the corpse, that Luisa was truly dead and that her death should be accepted as real and not merely apparent, as everyone had imagined. 1883 – At the age of eighteen, from the balcony of her house, she saw Jesus, bent beneath the weight of the Cross, who said to her: “O soul! Help me!”. From that moment, solitary soul that she was, she lived in continuous union with the ineffable sufferings of her Divine Bridegroom. March 4. 1947 – Full of merits, in the eternal light of the Divine Will she ended her days as she had lived them, to triumph with the angels and saints in the eternal splendor of the Divine Will. March 7. 1947 – For four days her mortal remains were exposed for the veneration of an immense throng of the faithful who went to her house to have a last look at Luisa the Saint, so dear to their hearts. The funeral was a realm triumph; Luisa passed like a queen, borne aloft on shoulders among the lines of people. All the clergy, secular and religious, accompanied Luisa’s body. The funeral liturgy took place in the main church with the participation of the entire chapter. In the afternoon, Luisa was buried in the family Chapel of the Calvi family. July 3,1963 – Her mortal remains were definitively laid to rest in the Church of Santa Maria Greca. - Es una de 5 hijos. Fue bautizada elmismo dia que nacio. - Desde niña fue atacada frequentemente por el demonio que la atormentaba. - Recibio la Primera Comunion y fue Comfirmada a los 9 años. instruyendola en la vida espiritual. - Al rededor de los 18 aos vio a Jesus con la cruz a cuestas. dejaban en esa condicion por muchos dias. Voluntad de Dios”. Sino que era reprendida como una caprichosa y desobediente. recuerdo también que la pena más dolorosa para mí era el no poder obedecer." - Un sacerdote (Rev. Michele De Benedictus) fue asignado para ser su confesor. El la visitaba diariamente y ella le confiaba lo que le pasaba en su interior. una sola comida al dia, a pesar de que no podia retenerla. escribir todo lo que trancurria entre ella y Jesus. - En todo escribio 36 volumenes, llamado "Libro del Cielo." tierra haciendo que el Reino de la Voluntad de Dios reine aqui."